Sometimes even I rebel at having to eat one more familiar meal. This lack of interest in food usually causes me to dig a little deeper in my files and either find something new or revisit an old-but-forgotten recipe. Such a search might lead me to the flavors of the far east or, specifically, China. These recipes usually have layers of tantalizing ingredients; combine them with satisfying noodles or steaming bowls of rice and it is usually just what I need to whet my stale appetite. 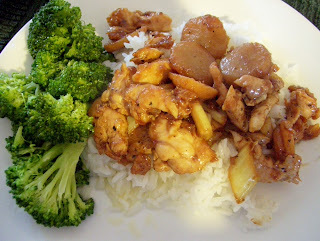 One old-but-forgotten recipe that resurfaced on such a hunt was General Chin's Chicken which I had learned how to make in a Chinese cooking class. This particular dish is fairly well-known and comes from the Hunan region of China...an area that provides a large variety of food choices for its people; the recipes are inventive and delicious. Many of the Hunan dishes contain hot peppers that, according to some sources, helped the people remove the dampness from their bodies. However, where Szechuan recipes usually add chili bean paste for the heat in their dishes, Hunan recipes are made with fresh or dried chili peppers, including the seeds and membranes which add a lot of heat. If this recipe looks like it has more than the usual steps in cooking it is because in the Hunan region, cooks spend a lot more time in the preparation and appearance of their dishes compared to other regional cooks. Don't let the list of ingredients and steps scare you off...this recipe is well worth the effort. ingredients and set aside for half an hour. Set wok or fry pan over high heat and add 3 T oil, swirling pan to coat sides. Add chili pods and stir-fry for 20 seconds until browned. Add green onion, ginger, garlic and then chicken; cook for 2 minutes. Add celery, chestnuts and sauce. Stir fry for 1 min. until thickened. Serve hot over rice or noodles. If you don’t want this dish to be so hot, use less chili pods.